Salif Keita and the Birth of Afro-Pop Malian singer-songwriter Salif Keita is a pioneer of African popular music who sings about racism and political struggle. Independent producer Reese Erlich goes to Bamako, Mali, to gauge the impact of Keita's music on the people of Mali and his role in the birth of the Afro-Pop sound. Malian singer-songwriter Salif Keita is a pioneer of African popular music who sings about racism and political struggle. Independent producer Reese Erlich recently traveled to Bamako, Mali, to gauge the impact of Keita's music on the people of Mali and his role in the birth of the Afro-Pop sound. 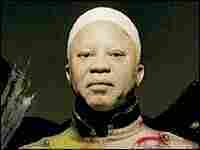 Salif Keita has been called the "golden voice of Mali" and a pioneer of the music called Afro-pop. He was born of royalty -- a direct descendant of Mali's 13th-century founding father -- but was shunned by his family. His albino skin (in Africa, albinos are widely considered bad luck) and poor eyesight made him an outcast. "The tradition makes albinos victims," Keita says. "They seem different because in Africa everybody's black -- and we are white." In the mid-1960s, he developed a new African dance music influenced by places both in and outside Africa, including black America and the Middle East. But today his music is looking back, using more traditional African instruments and a less electric sound. His latest CD is called M'bemba, which means ancestor. "The acoustic sound is more emotional, more spontaneous," Keita says. "It is closer to reality and this is a reality I was born in and grew up in." In addition to his musical career, Keita has begun a foundation dedicated to albinos and is trying to raise money for a school and clinic in Mali for people with the condition.